The Monk Evphrosyn of Sinozersk (Blue-Lake), in the world Ephrem, was born in Karelia near Lake Ladoga. In his youthful years he lived near the Valaamo monastery, and later he resettled to Novgorod the Great. Having there spent some length of time, the saint then withdrew to one of the Novgorod outskirts – the Bezhetsk "pentary" [a "fifth" of the "Pyatiny Novgorodskiya" – comprising anciently five strategically situated outlying village-districts of Novgorod the Great]. He became helper at church-services in the village of Dolossk, 20 versts from the city of Zhelezopol'sk Ustiug. The monk accepted tonsure at the Tikhvinsk Uspenie-Dormition monastery. In the year 1600 he began his wilderness life in the wild marsh-lands at the shore of Blue-Lake. Having set up a cross and dug out a cave, the monk dwelt here for two years, eating only wild vegetation. Unexpectedly, surrounding inhabitants came upon him, and they began coming to the monk for guidance, and several remained to live with him. In 1612, when Polish military detachments were laying waste to Russia, many a person was saved from pillage at his wilderness place. One time, the Monk Evphrosyn predicted that the Polish would come into this wilderness, and he advised everyone to flee. Many did not believe him. "Why then dost thou not withdraw from this sacred spot?" – they asked. The starets-elder replied: "I came hither to die for Christ". Those that obeyed the saint and left the monastery remained safe, but all those who stayed died an horrible death. Among the inhabitants of the monastery had also been the Monk Jona. Terrified at the prediction of the Monk Evphrosyn, he wanted to flee together with the others. But the Monk Evphrosyn held him back, firing up within the monk fervour for the house of God and a readiness to dwell in the monastery to his very end. "Brother Jona, – said the Monk Evphrosyn, – why this cowardly fear in thine soul? When starteth the battle, then mustneeds be shown courage. We gave a vow to live and die in the wilderness. We mustneeds be faithful to our word, given before the Lord. In such instance death results in peace. It is another matter for the layfolk: they are not bound in this by their word, and they mustneeds spare themselves for the sake of their children". After this the Monk Evphrosyn invested himself in the schema and spent the whole night in prayer. On the following day, 20 March, the Polish forces fell upon the monastery. The monk attired as schema-monk emerged from his cell and stood with upraised cross. The enemy flung themselves at him: "Old man, give us the monastery valuables". 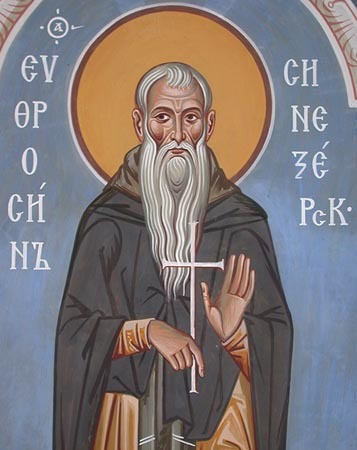 "All the valuables both mine and of this monastery – are in the church of the All-Pure Mother of God", – answered the monk, meaning by this the unstealable riches, which for believers are hidden within God. Not understanding this, the thugs rushed to the church, and one of them drew out a sword and struck the Monk Evphrosyn on the neck. His neck was cut half way through, and the holy elder fell to the ground dead. When the Polish, angered that they had found nothing in the church, returned – the murderer of the monk, not satisfied that the saint was already breathless, struck him on the head with a war-axe. The Monk Jona also perished. At the monastery also with the monks had stayed a certain pious Christian, Ioann Suma. When the enemy had burst onto the scene, he was in the cell of the monk. Despite his grievous wounds received from the foreign ruffians, Ioann remained alive. With the departure of the Polish, he regained his senses and reported to his returning son the things that had transpired. The surrounding inhabitants learned from them about the destruction of the monastery and the cruel end of the Monk Evphrosyn. The body of the monk was reverently buried on 28 March. On this same day they buried also the Monk Jona and all the others who had perished under the sword. And 34 years after the death of the saint, at his monastery was erected by a builder named Moisei a new church in the Name of the MostHoly Trinity and a bell-tower with a passage-way. With the blessing of the Novgorod metropolitan Makarii, on 25 March 1655 the relics of the Monk Evphrosyn of Sinozersk were transferred by the builder Jona beneathe the bell-tower.